Are you researching iBuyers like Opendoor and on the hunt for data? Do you work at a consulting or venture capital firm? Well, have I got the deal for you! You probably love the analysis, but as a discerning consulting you want more. You want the full data set -- which was painstakingly assembled from MLS records, listings from Opendoor’s web site, the Maricopa City Assessor’s public property records, public records sourced from Redfin, and a few "special guests." The complete data set from my three analysis pieces, totaling hundreds of individual records and associated analysis. Up to five days of my time to develop custom analysis and provide unique strategic insight on the iBuyer space. A glossy, leather-bound "Collector's Edition" of the seminal iBuyer analysis, Inside Opendoor. This pack is great for all sorts of consulting occasions, including: preparing an investment deck, running a market scan, due diligence, impressing friends, and more! This pack is available immediately for a special rate of $49,999.95. Act now; supplies won't last! Q: Wow, that's really expensive! A: If you're serious about this space, you're either thinking about a multimillion dollar investment (Opendoor has raised $320 million) or are getting paid high six-figures for your consulting work. In either case, we both know that $49,999.95 is a bargain for this unique data set. Q: Why would I pay you and not go directly to a big management consulting firm for this work? A: Given the number of web visitors and emails I get to "pick my brain" from the big firms, the source of the data is the same (me). Cut out the middleman and enjoy the savings! Q: Yeah, I think I'll just do it myself. Q: How hard can it be? A: Collecting and assembling the data is one thing, but the detailed industry knowledge and insights is another. If, like me, you've been following Opendoor for years, have been quoted by the NY Times, U.S. News & World Report, The Information, and Inman News as an expert on the space, presented at conferences and workshops, and also know the international space, then have at it! A: Kinda, but not really. As a special thank you, the first 100 customers will receive a "Twelve Months of iBuyers" calendar featuring all of their favorite analysis and insights. 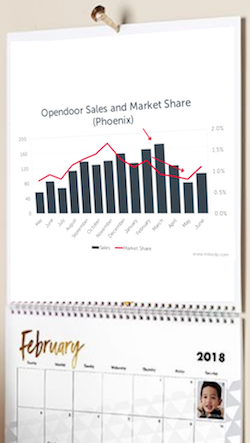 Be reminded of the growing traction of Opendoor in its key markets all year long!